← Our Phone is back! Now we’re into the warm summer, it’s useful to know how to keep safe from ticks and reduce the possibility of catching Lyme Disease when you’re exploring the countryside. Only a small number of ticks are infected with the bacteria that cause Lyme disease. But it’s still important to be aware of ticks and to safely remove them as soon as possible, just in case. Take extra care in the summer when ticks are most active, in areas with lots of deer or livestock and long grass or bracken. Reduce the risk of a bite by covering up, tucking your trousers into your socks in true Monty Python style or using insect repellent. Check yourself for ticks especially on your legs & groin. Extract the tick when you find it. To remove a tick use fine-toothed tweezers flat to the skin to gently grip as close to the skin as possible, and pull away steadily removing the body and head. Specialist tick removers can be bought at vets. Alternatively placing a blob of liquid soap entirely covering the tick, should make it fall off. Clean the bite with antiseptic or soap and water, then dispose of the tick. Most bites from an infected tick develop into a distinctive raised pink or red rash usually after 3 to 30 days, and up to 3 months. The skin will be red and the edges may feel slightly raised. The ‘bull’s eye’ pattern below can appear as more uniform in colour. It’s usually around 15cm across, but can vary in size. 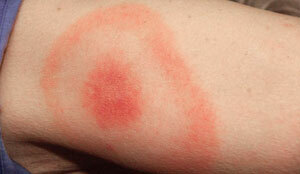 Around a third of people with early stage Lyme Disease don’t develop a rash. Further symptoms may develop 3 to 30 days after being bitten by an infected ticks, which can include flu-like symptoms such as: fatigue (tiredness), muscle and joint pain, headaches, fever or neck stiffness. If untreated some people can develop more serious problems affecting the joints, nerves and heart. Treatment – See your GP, if following a tick bite, you find the a circular red rash from an infected bite or develop the other symptoms of the disease. For more information please visit NHS Direct Website.